Functioning in a proper way, the thyroid gland produces just the exact amount of hormone that is required to regulate the metabolic processes of the body. But the problem arises when this gland produces either too much or too little of thyroxine, the vital body chemical that drastically influences body weight, mental health and energy level in the body. In order to understand “what is thyroid problem”; it is necessary to understand the thyroid gland in a better way. This is a small butterfly-shaped gland that is located in the front of the neck, and it is in control of metabolism, hormone regulation, and body weight and body calcium levels. Thyroid problems occur due to overproduction (hyperthyroidism) or underproduction (hypothyroidism) of the vital thyroid hormones. Acupressure therapy can be successfully used to restore hormonal balance and regulate the energy levels which help to manage emotions, promote sleep and treat menstrual problems. There are a number of powerful acupressure points all over the body that can be activated by applying right pressure. Hypothyroidism is a condition of the underactive thyroid gland in which the gland does not produce enough thyroid hormone which in turn causes the body processes to low down because of lack of energy. It also makes the metabolism sluggish. Hypothyroidism affects brain development, skin texture, muscle strength, body weight and even menstrual cycles in case of women. In acupressure therapy, hypothyroidism is described as a deficiency of Qi, Yin or Yan of the kidney. Here are a few specific acupressure points for thyroid that helps to treat hypothyroidism. 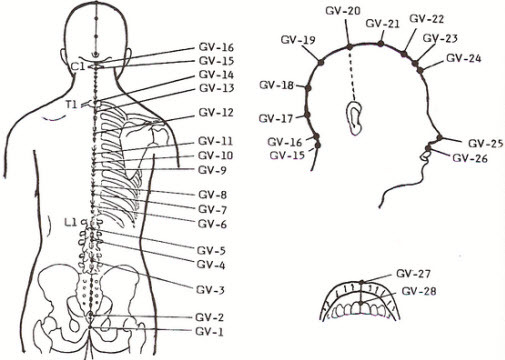 Acupressure point GV 7 or Governing Vessel 7 is an effective pressure point that is used to treat thyroid symptoms in men and women in case of hypothyroidism. This point is also called the Central Pivot, and it is located precisely at the mid-point on the backside of the body, mid-way between the end of the neck and the starting of the pelvic region. Stimulating this point helps in bringing up Yang energy that is beneficial for hormonal function. It is also a local point for back pain that helps to treat abdominal pain, poor appetite, and menstrual issues. KD 7 or Kidney 7 acupressure point is one of the most functional thyroid acupressure points that are beneficial for the treatment of hypothyroidism. This point is also termed the Recovery Flow, and it is situated on the medial aspect of the lower leg, at the border of the Achilles’ tendon, 2 cun above point KD 3. It is a tonification point of the kidney that regulates the Qi and Yang o the kidney. It is also a favourable pressure point for treatment of digestive disorders, abdominal distension, night sweating, weakness, numbness and pain in the legs. SP 6 or Spleen 6 is another important acupressure point that is used for thyroid problem treatment in case of hypothyroidism. This point is named the Three Yin Intersection, and it is located 3 cun above the tip of the medial malleoulus on the posterior border of the tibia. This point is the intersection point of the three yins that helps and activating this point helps to promote circulation, vitalize blood and tonify the liver, kidney and spleen. It is also used to treat digestive disorders, male and female sexual problems, menstrual issues, skin diseases, sleeping disorders, high blood pressure, dizziness, palpitations, and anxiety. The Yintang point is one of the most important acupressure points for thyroid problems that are widely used to treat hypothyroidism. This is one of the extra points that do not correspond with any specific acupressure meridian. 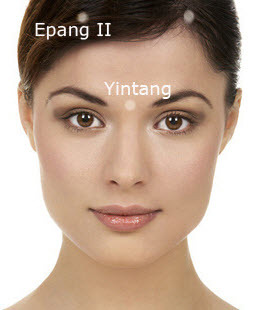 This point is named the Hall of Impression, and it is located between the two eyebrows, just below the area known as the third eye. It is a reflex point of the pituitary gland which controls the thyroid gland. It is also a significant point for calming the spirit and treating insomnia, stress, and anxiety. It is a local point for treating headache, sinusitis and congestion. Acupressure point LI 10 or Large Intestine 10 is a potent point of acupressure treatment for hypothyroidism located on the arm. 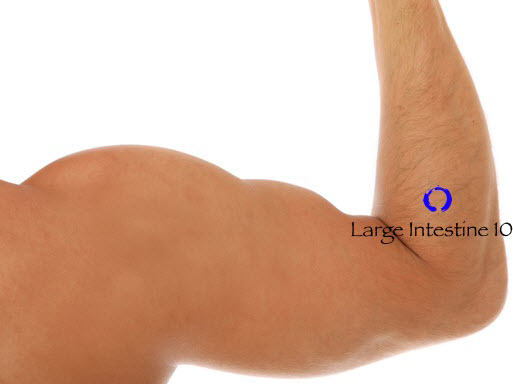 It is also called the Arm Three Li, and it is found on the dorsal radial side of the forearm when the elbow is flexed, 2cun below the transverse cubital crease. Stimulating this point helps in tonifying the blood and the Qi, for better functioning of the thyroid gland. It is a local point for tennis elbow treatment and is also used for addressing shoulder pain, diarrhea, neck pain, and stiffness. 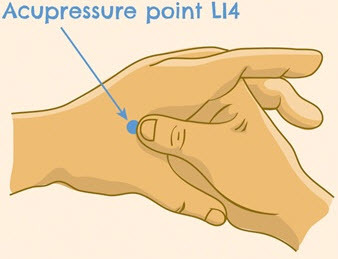 Acupressure point LI 11 or Large Intestine 11 is a powerful acupressure point for treating hypothyroid problem. It is termed the Pool at the Bend, and it is situated at the lateral edge of the elbow crease. Stimulating this point clears the heat and cools the blood and also regulates the Qi and the blood. This point is also used to treat fever, sore throat, malaria, shoulder pain, knee pain, eye problems, toothache, abdominal pain, digestive disorders and depressive psychosis. Hyperthyroidism is a thyroid disorder that is caused due to excessive secretion of thyroxine from the thyroid gland that leads to drastic weight loss, anxiety, palpitation, excitation, profuse sweating, dry mouth, excessive heat along with enlargement of the thyroid gland. This disease is more common among women and specifically young women. Hyperthyroidism is primarily caused by damage caused by emotional changes, an improper diet that causes stagnation of Qi, blood stasis or phlegm coagulation. This specific set of acupressure points can help in treating the symptoms of hyperthyroidism in a successful manner. GV 17 or Governing Vessel 17 is an effective acupressure point to treat thyroid symptoms in women in case of hyperthyroidism. This point is also called the Brain’s Door, and it is located on the head, 2.5 cun above the midpoint of the back hair line, in the depression on the upper border of the external occipital protuberance. Stimulating this point helps in relaxing palpitations, shortness of breath and anxiety – some of the common symptoms of hyperthyroidism. It is also useful for treating neck pain, stiffness of neck, dizziness, headache, mania, epilepsy, lockjaw, eye pain, asthma and muscular dystrophy. 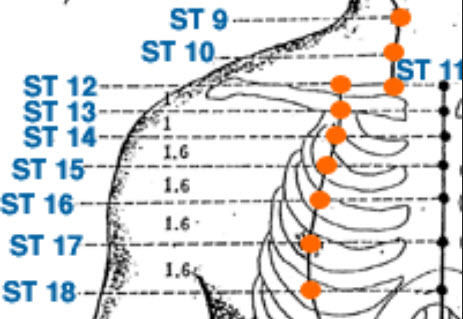 Acupressure point ST 9 or Stomach 9 is yet another useful pressure point for hyperthyroidism treatment. Its English name is Man’s Prognosis, and it is located in level with the tip of the Adam’s apple, on the inner border of the sternocleidomastoideus muscle. Stimulating this point helps in treating hyperthyroidism and goiter caused by Qi disorders. It is also beneficial for controlling high blood pressure, treating headache, dizziness, coughing, lower back pain, asthma and chest tightness and acute lumbar sprain. 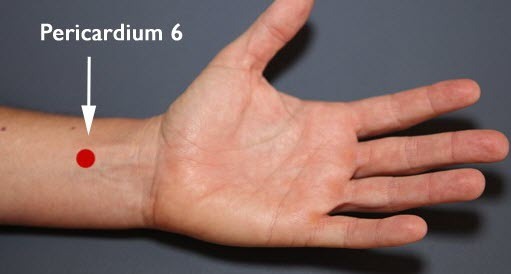 PC 6 or Pericardium 6 is an extremely important pressure point in acupressure therapy that is used to heal a wide range of health issues, and it is also helpful for treatment of hyperthyroidism. This point is termed the Inner Pass, and it is located 2 cun above the wrist crease, in between the palmaris longus and flexor carpi radialis tendons. Stimulating this point helps in clearing Qi stagnation and alleviates symptoms of hyperthyroidism like palpitations, stress, and nervousness. It also aids in treating asthma, angina, chest tightness, poor memory, motion sickness, vomiting and carpal tunnel syndrome. 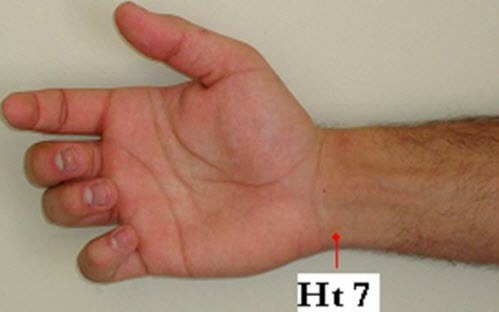 HT7 or Heart 7 is potent acupressure point for treating thyroid problems which is located on the wrist crease, on the radial side of the tendon flexor carpi ulnaris, in the middle of the ulna and the pisiform bones. This point is known as the Sprit Gate and it helps in addressing numerous symptoms of hyperthyroidism like anxiety, palpitations, panic, pounding heart and excessive sweating by tonifying the deficiencies of the blood, Yin, and Yang. It also helps in treating insomnia, muddled thinking, insomnia, nausea, fear, angina, irregular heartbeat and emotional and psychological issues. LI 4 or Large Intestine 4 is most famous acupressure point that is extensively used to treat various health issues and chronic pain. It is also beneficial for the treatment of hyperthyroidism. This point is termed the Union Valley and it is situated in the fleshy webbing present between the thumb and index finger. Stimulating this point on both hands promotes circulation of Qi and blood in the body to clear stagnation and control the functions of the thyroid gland. It is also used to boost immunity, treat TMJ problems, excessive sweating, acne, eye problems, headache, allergies, and fever. Last but not the least is the acupressure point ST 30 or Stomach 30 that is also known as the Beautiful Bulge. 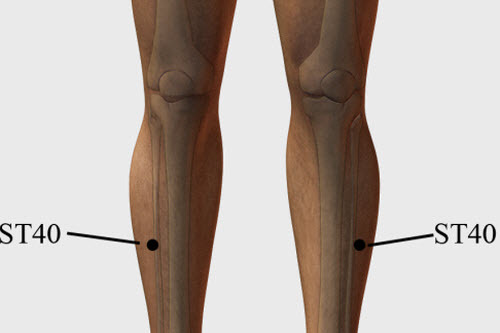 This point is located on the lower leg, midway between the tibiofemoral joint line and the lateral malleolus, and two finger-widths lateral to the anterior crest of the tibia. Activating this point clears phlegm and dampness, calms the spirit and activates the channel which in turn aids to improve the functions of the thyroid gland. It also helps to treat headaches, dizziness, vertigo, mania, asthma, cough, chest oppression, sore throat, pain in lower legs. So, now that you have idea about how to cure thyroid problem with acupressure therapy and which are the specific pressure points for hypothyroidism and hyperthyroidism, try to stimulate a few of them at your own convenience and see the wonderful results. Wanted help for treating hypothyroidism. In allahabad, U.Please. Hi ,I am a hypothyroid for the last 16 yrs.but it is in control..but I took accu treatment to get relief from taking eltroxin pills..after a 30 days session of accu treatment my TSH level gone above 150? . My accu therapist also got confused. Could you pls suggest me the reason. Thx. Hope you are making necessary lifestyle changes along with your treatment, exercise and diet plays an important role. https://www.modernreflexology.com/reflexology-points-to-control-diabetes/ follow this article for best results. We are so glad we could help you.